Running your business’s social media accounts can be a daunting task. This is especially true when you realize the time and dedication it requires. Sure, it’s easy to run a personal account and post random thoughts you have throughout the day, or share a meme you found funny, but when it comes to doing so for your business, there’s a level of professionalism and commitment that should be adhered to. With the abundance of information and recommendations available on the internet, it’s difficult to pinpoint exactly what works and what doesn’t on social media. I’m here to share what we’ve found works when it comes to ramping up your Facebook and Twitter presence. 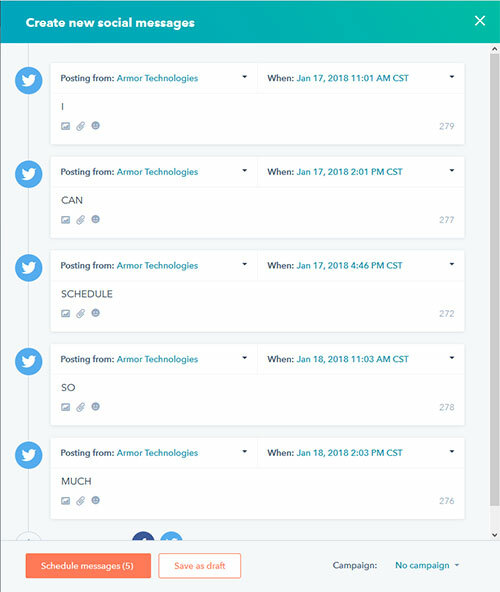 We use HubSpot’s CRM to schedule the majority of our Twitter and Facebook posts. The tool is incredibly easy to use, as you can bulk schedule in a single window. This is especially useful for Twitter, since the posting demands are much higher. Facebook offers its own scheduler within their publishing tools that is also super easy to use. The only downside to Facebook’s tool is that you have to schedule the posts one by one. But once they are scheduled, you can go back and view them anytime from the dashboard to edit the content, to edit the schedule time, or to remove the post entirely. We learned the importance of scheduling and staying on top of things when we were inactive on Twitter for just over 24 hours. We lost 30+ followers in that time frame. When are the ideal times to schedule? HubSpot says posting on Facebook during the weekends garners 32% higher engagement rates, as opposed to the 18% for Thursdays and Fridays. 9 a.m., 1 p.m., and 3 p.m. were the front-runners as far as specific timing. You should be posting on Twitter multiple times daily, but the best day to post is Wednesday. Time winners are 12 p.m., 3 p.m., and 5-6 p.m. As with anything, it is always best to test out different times to see what works best for your business. Track your interactions and statistics in both Facebook and Twitter’s tools to narrow it down even further. We love staying on top of current events and holidays. Being located in a college town, we share news from Northern Illinois University’s Robotics Club or Engineering School as it relates to our industry and allows us to connect with the local community. 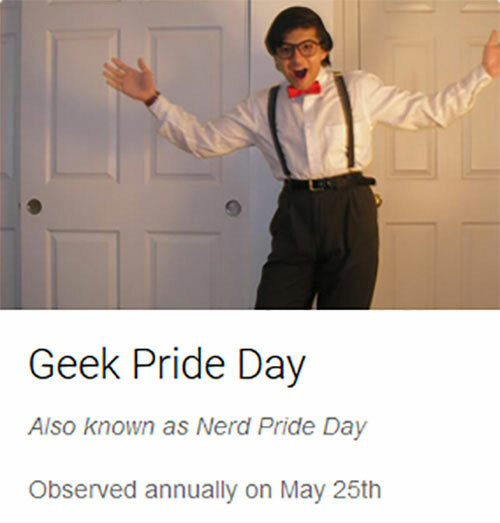 We also constantly surf through Checkiday for quirky tech-related holidays that we can post about. Using Trendspottr and Pocket to see what news is trending within our industry is great, too. We highly recommend both, as sharing a link with a short snippet is one of the quickest and easiest posts you can create. We also love going a step further and being active in events within our community. We attend events through the local Chamber of Commerce, as well as festivals, in order to network and get our face seen in the community. OK—So what do I post? Remember the 80/20 rule when it comes to sharing on social media: this is a general rule for content that is shared by you on your social media pages. Only 20% should be self-promotion, while the remaining 80% should be content that interests your audience and seeks engagement with them. When using your self-promotion 20%, be sure you include a call-to-action that encourages the type of reaction you want from the user (e.g., fill out a form, download a file, comment, etc.). The 80% should be something that is shareable (and we aren’t just talking about cat memes here). These are trending topics that your audience would be interested in, asking users about personal preferences (favorite music to work to, favorite phone apps, favorite part about their job, etc. ), question-and-fill-in-the-blank forms, inspiring quotations, and more. Experiment and see what works for you and your audience! As far as creating images go, there are various sites we use to make eye-catching pictures. 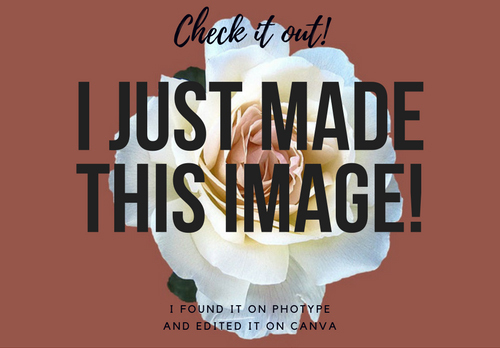 Canva is my personal favorite: it’s essentially a mini version of Photoshop that includes tons of templates and icons, so you can customize and create whatever you can imagine. Photype is another excellent site that provides high-quality stock images. Photype compiles images from nine credible image sources, three of which are totally free. Posting to your business’s social media doesn’t need to be a scary task. With all of these tools at your disposal, your strategy is as easy as ever. Now that you’ve got a better idea of how to start posting, check out how to target your ideal audience on Facebook! What didn’t I cover that you would like to know more about? Fill out the form below to let me know.